During “AUNTSforcamera” open-studio hours, Museum visitors are invited to move freely through the Theater, observe the artists at work, participate as appropriate, and in some cases even become part of the work. AUNTS is a community-building apparatus for organizing simultaneous performance and art activity in a shared space. This fall the New Museum, by invitation from the Stedelijk Museum Amsterdam and TrouwAmsterdam (a nightclub and arts space), is organizing a special international dance-for-camera edition of AUNTS as part of the “Trouw Invites…” exhibition series. Participating AUNTS artists include: Cara Francis, IMMA/MESS, Vanessa Justice, Anya Liftig, Karl Scholz, Larissa Velez-Jackson, Gillian Walsh, Collective Settlement (Felicia Ballos, Jean Brennan, and Charnan Lewis), and joint collaborators Salome Asega, Chrybaby Cozie, and Ali Rosa-Salas. “AUNTSforcamera” unfolds publicly through an open-studio production week, shared simultaneously by all participating artists and resulting in several new dance-for-camera works that will be exhibited as an immersive moving image installation at Trouw and, later, the New Museum (including new material produced with artists and audiences at Trouw). The individual works produced through this project uniquely engage the relationship between dance and moving-image media, both in terms of their creation as part of a shared open-studio process and their subsequent presentation as part of an AUNTS-organized moving-image installation. Here, AUNTS is utilized as an apparatus to interrogate, and occasionally undermine, the systems of autonomous control that characterize visual framing and the construction of time and space within moving-image production and display. “AUNTSforcamera” is curated on behalf of the New Museum by Travis Chamberlain, Associate Curator of Performance and Manager of Public Programs. It is included as part of the Fall 2014 R&D Season: CHOREOGRAPHY, organized by the New Museum’s Department of Education and Public Engagement and overseen by Johanna Burton, Keith Haring Director and Curator of Education and Public Engagement. Founded in 2005 and based in Brooklyn, AUNTS is currently organized by Laurie Berg and Liliana Dirks-Goodman. Core principles of AUNTS are collectivity, cooperation, and sharing. 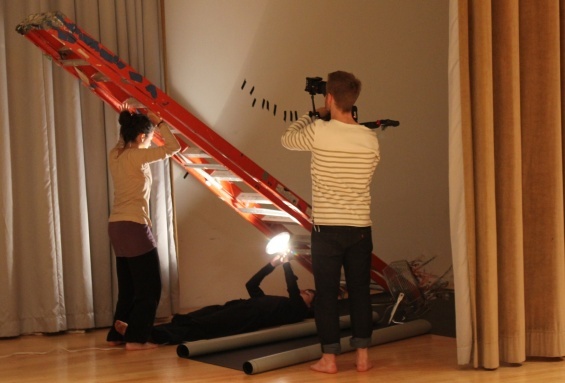 Through the AUNTS apparatus, artists (from the NYC contemporary dance community and beyond) come together to share the same space at the same time, negotiating the simultaneous presentation of their work in relationship to one another. Often taking the form of an immersive live event, audiences are free to move through AUNTS, engaging with as many or as few of its offerings as they like, choosing their own path through the event and creating their own experiences through chance encounters. The whole could be viewed as a work independent from, but no more/less important than, its individual constituent parts. Since 2005, AUNTS has organized approximately fifty events and hosted more than four hundred artists from all disciplines and at various points in their careers. “Trouw Invites…” exhibition series is made possible by support from De Verdieping, TrouwAmsterdam, Stedelijk Museum, AFK, SNS Reaal Fonds, Stichting DOEN, Prins Bernhard Cultuurfonds, IAmsterdam, Stadsdeel Oost, ABN AMRO, and Lloyd Hotel.